Posted June 28, 2018 by Ernie Martin. During an interview for an upcoming episode of The Savvy Report, I asked my guest to share a little about his background in accounts payable and shared services. Among the items he touched on was the notion that many suppliers believe submission of invoices by email is electronic invoicing. This not the first time I’ve heard practitioners on the AP side mention this. Almost every time I have an opportunity to share the results of our Perceptions Study and focus on how suppliers submit invoices to their customers, many suppliers in the audience view invoice submission via email as electronic, and understandably so. 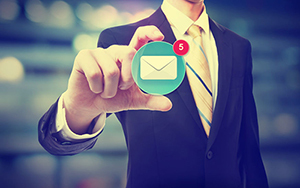 Email, for all intents and purposes, is electronic and users often see anything associated with it as electronic as well. Additionally, many players in the order-to-cash space have not done a good job explaining what true electronic invoicing really is and why it’s critical to AP departments when trying to process and pay invoices quickly and with as few exceptions as possible. 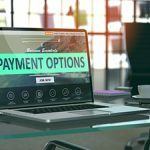 There are many entities in this space identifying some methods of invoice submission and automation as electronic invoicing when, in reality, they are not. 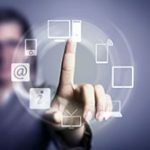 The reason email invoicing cannot also be electronic invoicing is simple; with email invoicing someone somewhere has to manually intervene in the process when invoices are being submitted via email. The data contained within that email must manually be entered into the customer’s accounting system to begin the approval and payment process. 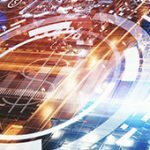 Even if PDFs in approved formats are being submitted via email, optical character recognition is available, and machine learning is deployed somewhere along the process, there remains some human involvement and an invitation to human error. Because of this, email invoice submission has replaced paper as the key hindrance to straight through processing. When we analyzed the results of our 2017 Perceptions Study, we saw an increase in the percentage of respondents using email to submit invoices compared to the data from our 2015 study. The percentage grew from 68% of respondents submitting invoices via email in 2015 to 78% submitting invoices this way in 2017, surpassing the percentage of respondents submitting invoices via paper (76%). 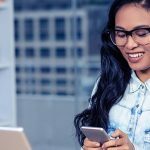 It’s one thing to discover email surpassing paper as the more popular way to submit invoices, but what’s important is understand why this has taken place. 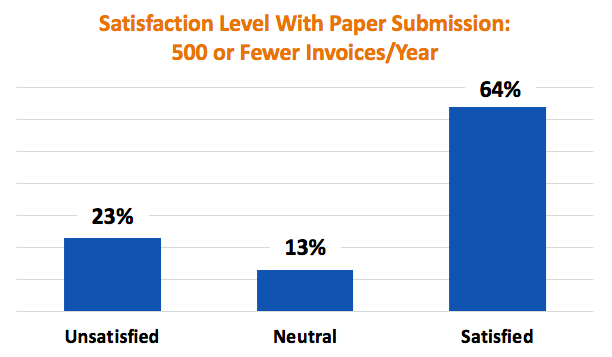 During the course of our study, we not only asked respondents how they submit invoices, we asked what level of satisfaction they receive when they submit invoices via the way they indicated. What we discovered was very interesting. 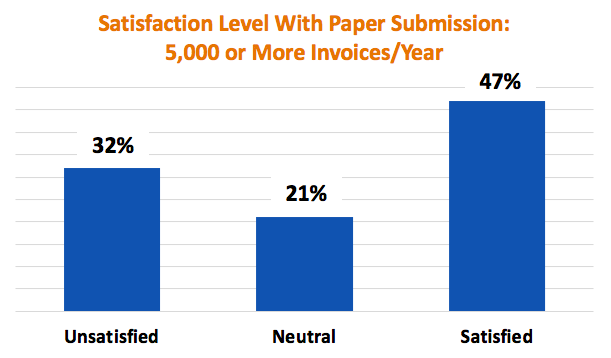 Of respondents using paper to submit invoices, 25% expressed some level of dissatisfaction. 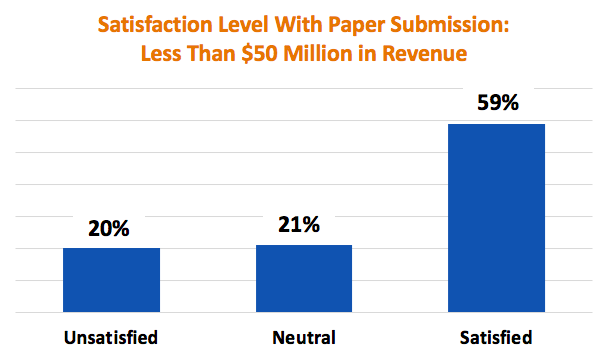 But, the more telling number was the 55% who expressed satisfaction with paper submission (Figure 1). That 55% number is relatively high, especially for an invoice submission method that has supposedly been on its last legs for the past 20 plus years. But, we shouldn’t stop there if we want to fully understand why email invoice submission is overtaking paper as a preferred method. We can dig a little deeper to determine if there are invoicing behaviors driven by level of company revenue as well as a company’s annual invoice volume. 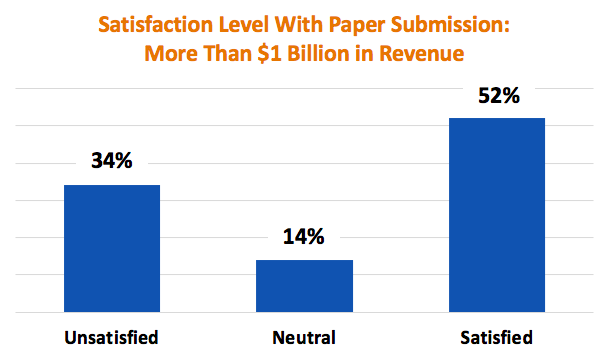 If we identify two segments, companies with revenue of $50 million and below in addition to companies with revenue of 1 billion and above, we begin to see which companies experience greater satisfaction with paper and email. The data around invoice submission via email is very eye opening, especially for organizations with more than $1 billion in revenue. Conventional wisdom might suggest that larger organizations have a greater understanding of the pitfalls of paper and email invoice submission. 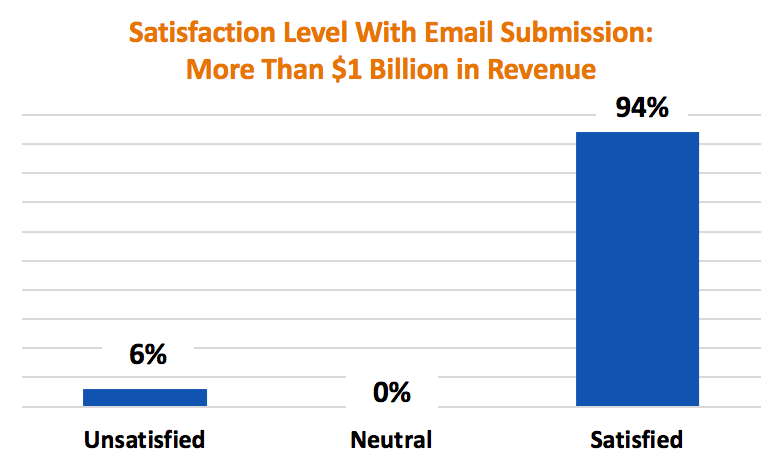 While this appears to be illustrated among larger organizations submitting paper invoices (lower levels of satisfaction), just the opposite appears to be true for larger organizations submitting email invoices (the highest levels of satisfaction). 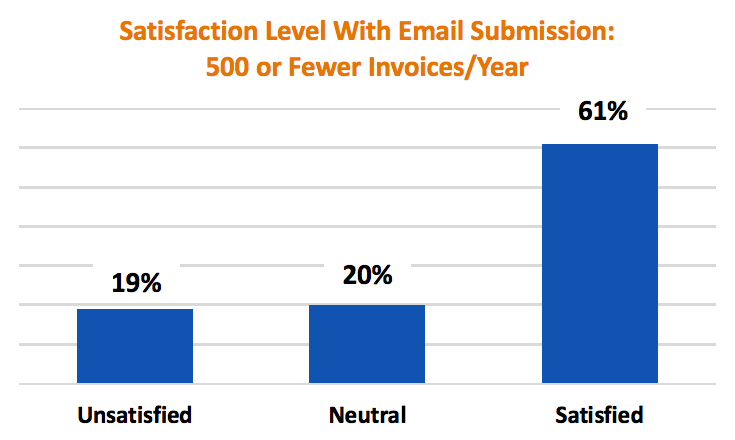 In short, larger companies appear to be driving the affinity for invoice submission via email, not smaller companies. To be sure this is the case, we can also configure our data in such a way as to isolate behavior based on annual invoice volume. We can now look at invoicing behavior among organizations that submit 500 or fewer invoices per year and compare that group to organizations that submit 5,000 invoices or more per year. Once again it appears that larger companies are driving the love affair with email invoicing more so than smaller companies. In the coming weeks, we will also look at the satisfaction levels organizations experience with other invoice submission methods such as third-party e-invoicing networks, customer-created portals, EDI and ERP solutions. 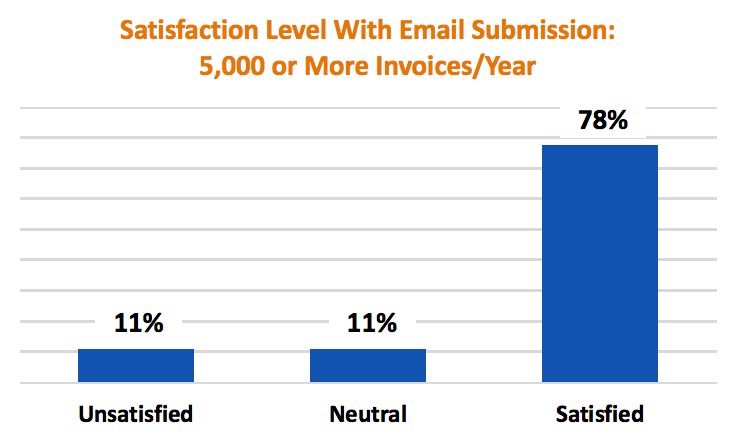 For now, we can clearly see that larger companies do appear to be less inclined to receive high levels of satisfaction from submitting invoices via paper, but they do appear to receive a lot of benefit from submitting invoices via email. 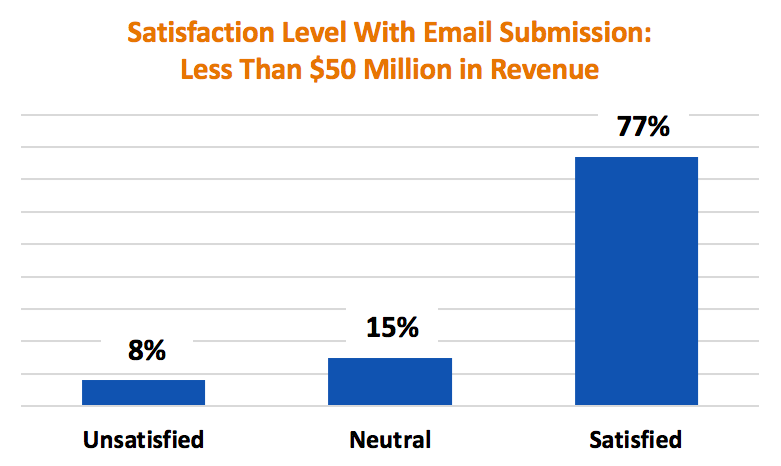 It’s these high levels of satisfaction among larger organizations that appear to be driving the rise in email as an invoice submission method.